15-01-2019, 01:01 - Does MSX.org block ATT (mobile) IPs? 31-10-2018, 02:35 - openMSX "Accuracy"
18-10-2018, 08:29 - MSX Blaster by 8bits4ever, does anyone have any experience with this? 03-10-2018, 22:43 - Best spreadsheet for MSX2? 18-09-2018, 04:09 - The Castle new rooms!!!! 16-09-2018, 16:16 - New japanese productions for MSX? 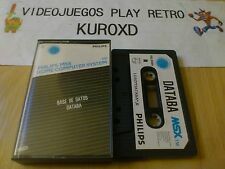 13-09-2018, 16:46 - What MSX game have you spent the most time with? 12-09-2018, 23:54 - What MSX game have you spent the most time with? 11-09-2018, 04:28 - Multi-platform DAAD Adventure Writer v2 R2 released!